How to Measure Body Fat: Throw Away Your Scale and Calculate Body Fat the Right Way for You! Why do you need to know how to measure body fat? Why would you want to calculate body fat percentage and see if yours is a healthy one? And why should you throw away your bathroom scale? Find the answers to these questions here, along with 5 different methods of measuring your body fat. Before anything else, you should know that your weight as a number alone doesn’t tell you how much of your weight is fat and how much is muscle mass, which is heavier than fat. So if your weight increases because you’ve worked out and gained lean muscle mass it’s all good – as long as your body fat percentage diminished. That’s why you’ll want to determine the amount of body fat – since you need to lose fat rather than muscle mass and/or just water. 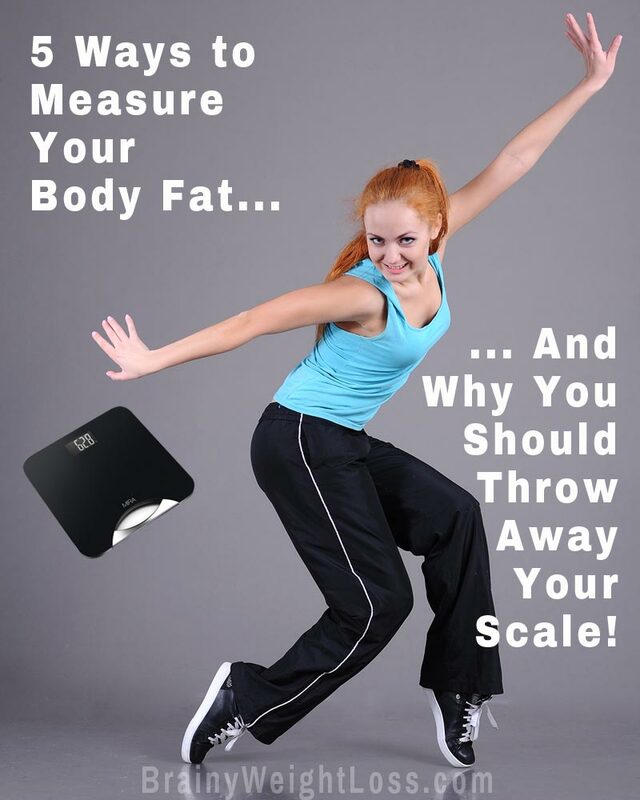 So you can throw away your scale! If you are familiar with what is a good body fat percentage, you know that – depending on your age – a healthy body fat percentage is between 19-31% if you are a woman, and between 11-23% if you are a man. For example, if you’re a young woman weighting 180 lbs and your body fat percentage is 35%, it means that you have 63 pounds of fat… You should aim to reduce this to approx 45 pounds, which represents a healthy body fat percentage of 25%. So here’s how to measure body fat. These different ways to measure body fat are increasingly accurate but less practical (and less affordable) as you go down the list. You may not have access to a hydro-densitometer in a water tank. And, you may not afford to get a CT scan just to find out your body fat percentage. So the last two methods listed here may or may not be for you, but you should know about all the options available. And there’s one more thing to consider. Depending on how conditioned your body is and how much body fat you have, the method you use to measure your fat percentage is increasingly accurate. For example, if you exercise consistently and have a more muscular body, use the skinfold test for a more accurate measurement of your body fat. On the contrary, if you haven’t exercised in years (or never in your life), you are better off measuring your waist-to-hip ratio (especially if you’re a woman). Or, go with an even simpler way to determine how much you’re over your normal weight relative to your height, using the BMI (Body Mass Index). Then, as you start to exercise regularly and your body composition changes, so does the way you measure it. So, when it comes to the different ways to measure body fat, the most important thing is to go with what’s most appropriate for you NOW. The Waist-to-Hip Ratio (WHR) is the simplest method to calculate body fat. However, it gives you only a ballpark figure rather than an exact body fat percentage. This method estimates your body fat, telling you whether you have an apple or pear shape body, so you can follow either one of these two different fat loss strategies. Using a soft, flexible tape measure, measure your waist at the narrowest point and your hips at the widest point. The tape should feel firm against your skin so that it stays in place but not too tight. Stand up straight, relaxed, and without sucking in your tummy. Skinfold Testing is another convenient, do-it-at-home method to calculate body fat percentage. In fact, it is the most common of all ways to measure body fat. That’s because skinfold testing provides a great consistency over repeated measurements. You can easily do it with a good quality skinfold caliper, like Accu-Measure, for example. Skinfold testing is based on the fact that you store most of your body fat directly under your skin – a.k.a. subcutaneous fat. You can calculate your overall body fat percentage very accurately by grasping the skin and underlying tissue. Shake it to exclude any muscle and pinch it between the jaws of the caliper. BIA (Bioelectric Impedance Analysis) Body Fat Scales with hand grippers measure body fat percentage by passing a low-intensity electrical current through your body and measuring its electrical conductivity – since fat is less conductive, due to its low water content. Although highly marketed, BIA body fat measuring may give you inconsistent results at different times. That’s because your body’s water content fluctuates greatly throughout the day. To get an accurate result, you must not eat, drink or exercise several hours before this test. Even drinking coffee and alcohol must be avoided prior to this test because they dehydrate your body, distorting the measurement result. Underwater Weighing is considered the most accurate (although somewhat impractical) among all the ways of measuring body fat. Underwater weighing is based on Archimede’s Principle, or the Law of Buoyancy, which explains why submerged things stay afloat: “any object, wholly or partly immersed in a fluid, is buoyed up by a force equal to the weight of the fluid displaced by the object”. Since fat is much lighter than water, the more fat you have, the more you will float. By measuring the amount of water you displace when immersed, a technician can determine your body density and calculate body fat by using a certain formula. If the thought of being dunked with all the air blown out of your lungs in a water tank while sitting on a chair that hangs from a scale appeals to you, go for it. CT scans are the most accurate (and the most expensive) ways to measure body fat. Also called Dual Energy X-ray Absorptiometry (DXA), this test uses a whole body scanner and two different low-dose x-rays to read bone mass and soft tissue mass. From these two readings, a technician can then calculate body fat. Particularly useful in giving a ratio of visceral fat to subcutaneous fat, this test measures not only your body fat percentage with a 1-3% error margin, but your bone density too. However, the cost of this method is prohibitive for most people like you and me. If you are like most people visiting this site, you are interested mostly in getting rid of flabby fat and getting into shape, rather than getting a ripped set of abdominals, right? If that’s the case, the most practical ways to calculate body fat are the first two on the list above: the waist-to-hip ratio (WHR) and skinfold testing. Or, you can use a body fat index calculator. Regardless of the method used, once you know the percentage of body fat you have, you can determine where you stand by checking the healthy body fat percentage chart.